The game begins with a standard tutorial battle. You'll be taught the basics of combat in The Banner Saga, namely moving about the field, attacking enemies (health and armour both), and so forth. One of the important things to take away here is that the varl (the giants) take up four spaces, while the human enemies take up only one space. This grants the varl greater range, but it also opens them up to more abuse. Don't worry about settling in of your own accord. The tutorial will do most of the strategic work; you just have to follow its advice. - After completing the tutorial battle, Ubin (you!) will be approached by a little steward named Eirik. He'll tell you of trouble with Skalfings down at the market. After he's done chatting you'll get a view of the city you're in; choose the Market as your next destination (the red-and-white tent on the left side of the city). 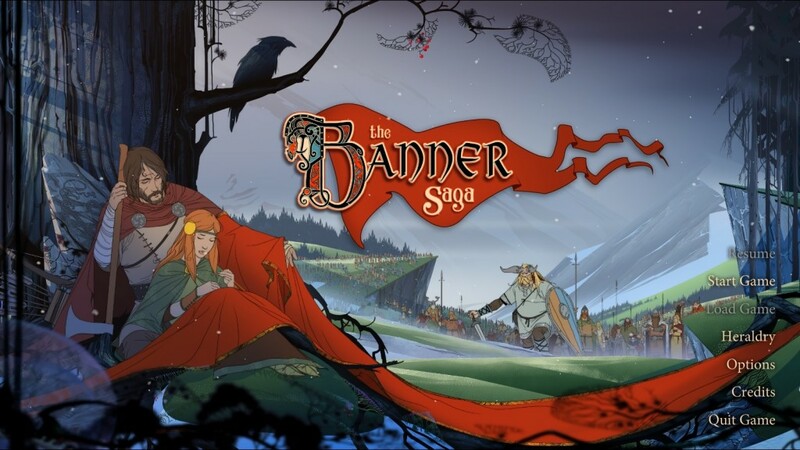 Tromping through the wilderness of The Banner Saga. - Eirik will get into a conversation with Hadd, a squirrely fella who works in the Market. You can either let Eirik handle the situation or intervene; if you intervene you can give Hadd silver for info or have one of Ubin's men intimidate him into speaking up. Regardless of your approach you'll get what you want. - After you're done with Hadd, Ubin's man Gunnulf will stroll up in new threads. Compliment or insult him as you see fit. - Next stop is the Mead Hall, just above the main gate. You can either help Eirik fight or beg off and do nothing. Fighting is more fun, and the Renown is handy. 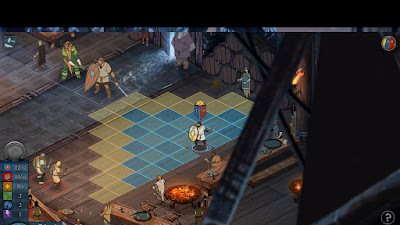 The Mead Hall battle in The Banner Saga. Your first real fight is preeeetty easy. 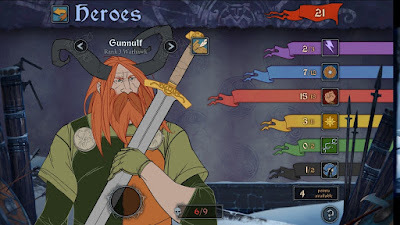 You have four soldiers in this battle: Valgard (human), Eirik (human), a Shieldbanger (varl) and Gunnulf (varl). These four are going up against an assortment of Thug Swordsmen, as well as their Thug Leader. The battle isn't quite split fairly - Valgard's a little ways off on his own - but you can easily make it fair by sending the Shieldbanger over to help Valgard. Your two pairs of two men can then split off and take on four and five men apiece (roughly) or pull back and fight back-to-back as a group. 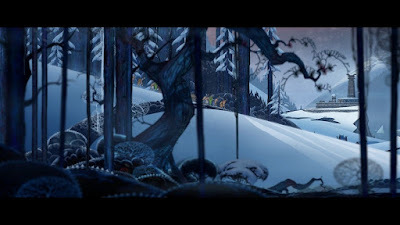 - Afterward, Eirik will ask for a further favour; again, you can agree to it or ignore Eirik completely. Agreeing is favourable, and will earn you some help down the road. - Down to the Docks next, on the left side of town. Ubin will chat with Vognir and Hakon, two younger varl. - Jump to a split. You can either follow Hakon, speak to the prince mentioned in the previous cut scene, or skip it all and return to the Great Hall for sleep. FOLLOW HAKON. Ubin has a chat with Hakon about past and future glory. FOLLOW PRINCE LUDIN. Ubin has a chat with the prince. If you choose the third option you'll get a bit more out of Ludin; simply introducing yourself will earn Ubin the brushoff. GREAT HALL. Head here to sleep. When you wake up in the morning you'll either find supplies and a double tithe waiting, or... not so much. Depends on how well you treated Eirik. If you helped out, you'll get a further 20 Renown. 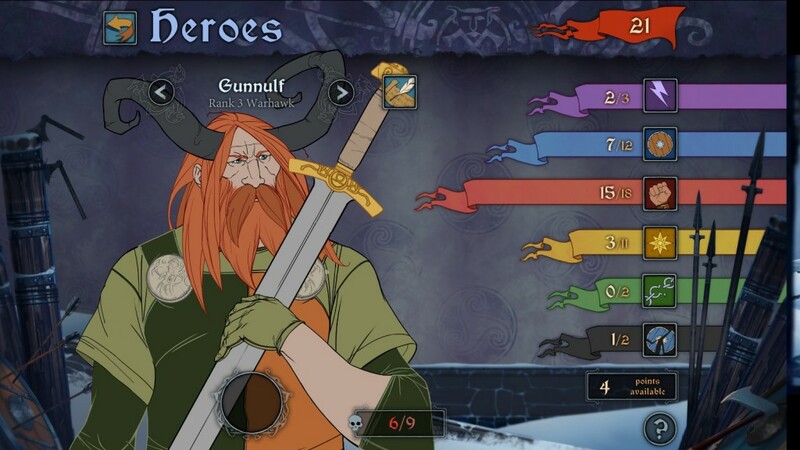 The stats page of one of your heroes in The Banner Saga. in the bottom-right corner for more details on stats. - The caravan will head off a short ways. At the end of the day another varl named Mogr will offer Ubin alcohol; you can either drink a little, drink a lot, or toast to Vognir. Thereafter you can talk to Vognir, drink merrily, or ease up a little. Speaking to Vognir is more revealing in general. - After some more conversation on the next day you'll get a shot of the world map. Click on the place names scattered about the map for info on what lays ahead. (Possibly in subsequent games, as well.) Your destination is Grofheim, to the north. 'Promote' your heroes in the Heroes Tent via Renown. Gunnulf's probably the only one you can upgrade now. Train your warriors in the Training tent. There's no Renown granted, but it's still an interesting exercise if you're unaccustomed to combat. Rest to regain Morale, or to heal heroes who were wounded in combat. Resting is wise - so long as you have lots of Supplies. No need to do it right now. You can also view the vital statistics of your caravan via the top menu, including the number of Clansmen, Fighters, and Varl you have at your disposal, the days' worth of Supplies available to the caravan, and the overall Morale. The worse the Morale, the less Willpower points your party members will have when entering combat. - Once you're done looking around camp, Leave. You'll get into a fight. This battle begins with a short tutorial on the importance of waypoints and sapping an enemy's Strength and Armor. This latter point is, yes, very important, as Ludin shortly discovers. Once he goes down the battle begins in earnest. Ahh, the infamous dredge. Ludin's down for the count, leaving your three varl to wipe up in his place. It's tempting to begin this battle with a dogpile on the Dredge Brute, seeing how it's the most dangerous, but take the opposite tack and pull your varl back a bit. By doing so you can lure the two weaker Dredge Grunts towards you first. Wipe them out one at a time, then gang up on the Brute and chew away at its Armor. Cause it enough pain and it will try to bring other Grunts in to help, but if you're fast enough you can kill it off before it's done summoning. Hakon's Sundering Impact is a godsend in this fight. During this battle you'll also learn about your Horn. Positioned at the top of the screen, the Horn slowly fills up as you kill enemies, to a maximum of five saved charges. Click on the Horn's sun during a character's turn and that character will gain a free point of Willpower. These charges are absolutely essential to tipping the scales in some fights, and should not be forgotten. Seriously, you'd be amazed how often Willpower comes into play. - Once all is said and done, you'll be informed - rather nonchalantly, in fact - that Vognir is dead. Ouch to that. On to a new crew!